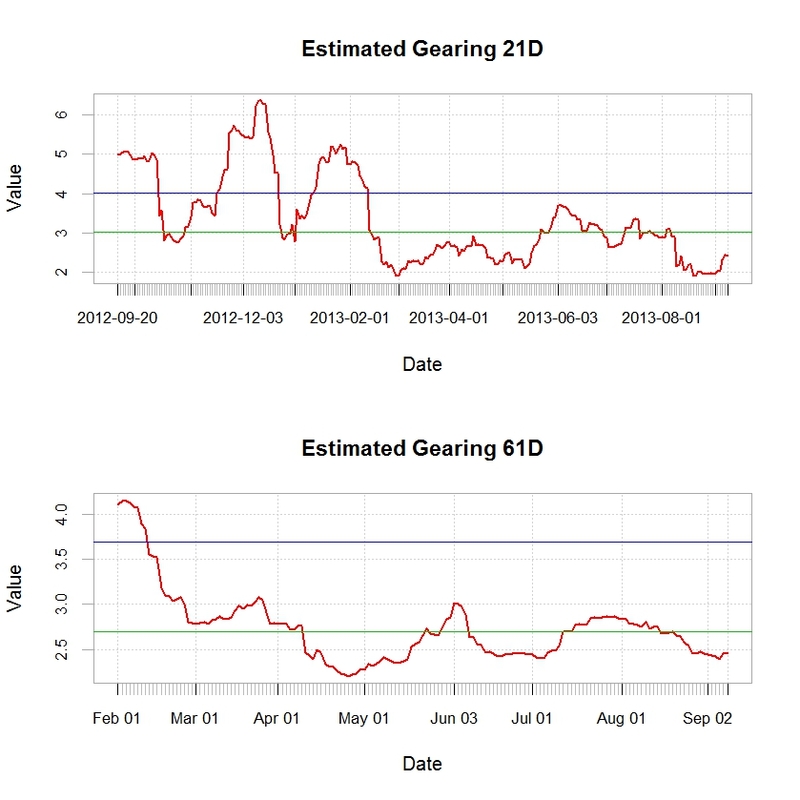 It seems that the risks flagged for September are slowly vanishing and that the risk agenda is now relatively clear for the remainder of the year. Syria is still a concern but there is now a possible alternative to a direct military intervention which is somehow good news. The German elections are nearing and though some uncertainty remains as highlighted by recent surveys, Merkel remains the likely winner. Of course there is the Fed meeting on the 17th & 18th and the market eagerly speculating on the semantics of the Fed communique. Tapering or business as usual ? 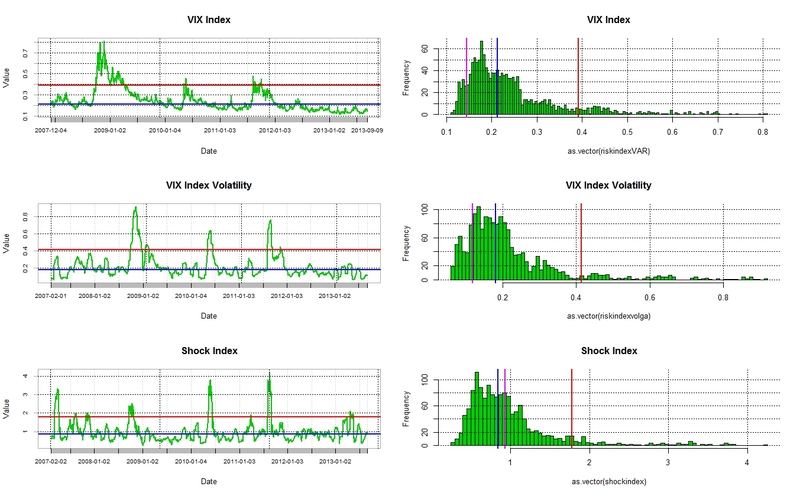 My thought is that all this is overblown and that we have been given a clear path of what will be the Fed monetary policy in the forthcoming cycle…so no real tradable surprise…Anyhow the equity market is taking this pretty well so far as reflected by last month performance and the low level of risk implied by the VIX. So business as usual…long those equity betas and short bonds…. 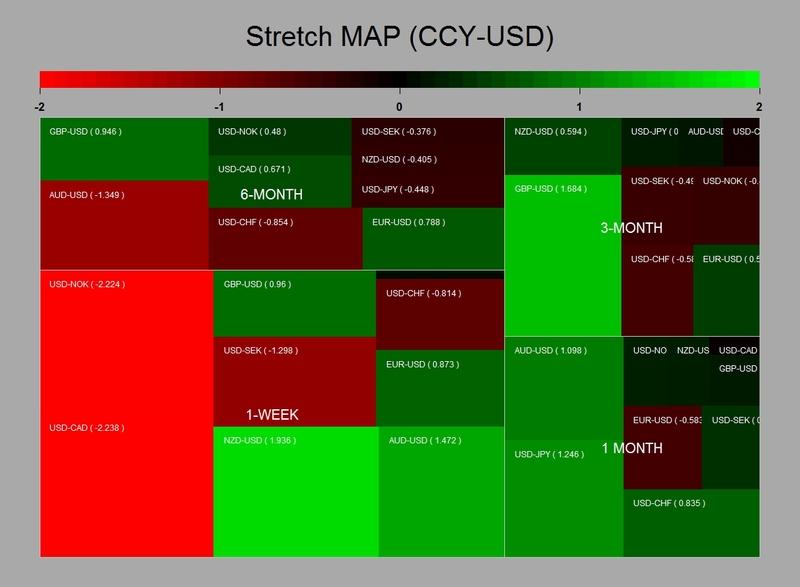 FX market have been correlating fairly well with the equity market and we have seen commodity currencies recovering significantly over the last few sessions . Also the Yen carry trade still in favour with USDJPY breaking the 100 level. 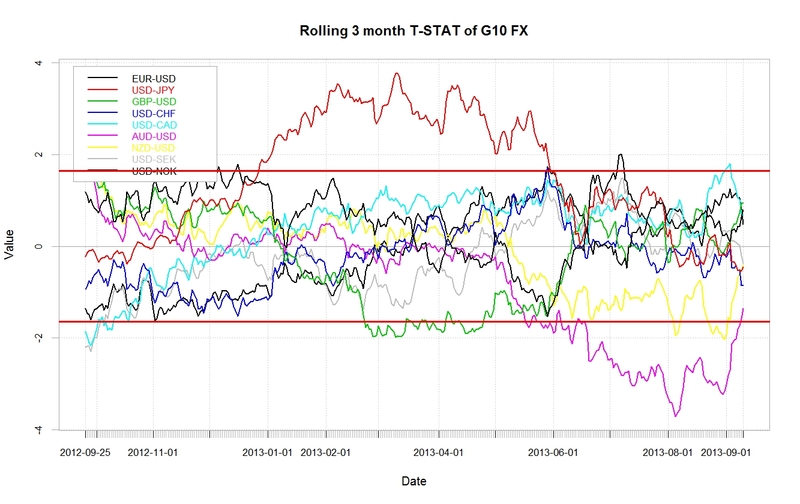 That being said most of the currencies have remained within statistically normal boundaries as indicated by the below charts which show the current T-Stats for major dollar crosses and also their rolling 3-month T-Stats relative to a 95% confidence interval. 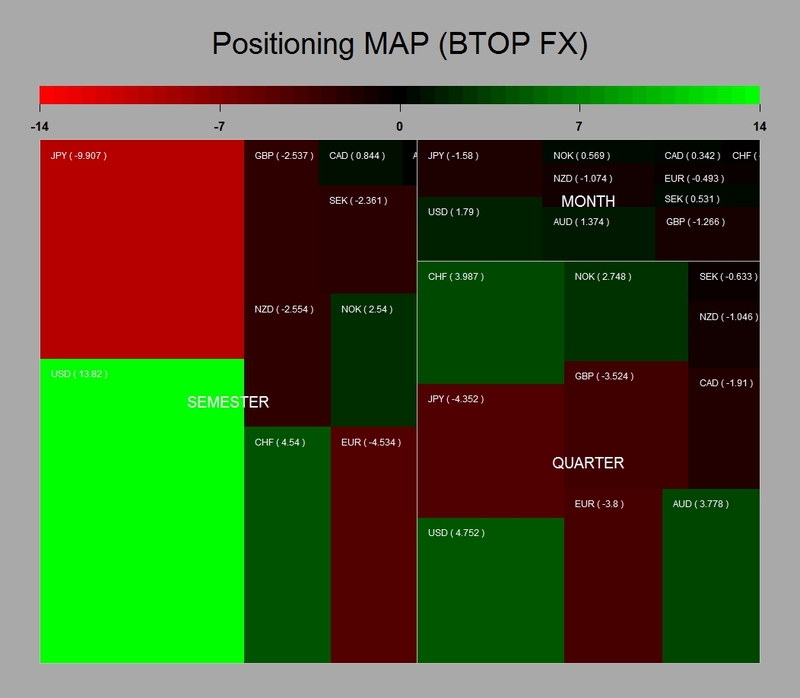 The below charts shows the sensitivity of the BTOP FX to major dollar exchange rates and therefore and idea of the portfolio content of most FX managers. The USDJPY seems to be the trade favoured by the speculative community as well as dollar long generally speaking. Maybe more interesting is the second chart that shows an estimate of the leverage used by the FX managers peer group. It is derived by comparing the variance of the BTOPFX index and the Variance of the estimated sensitivities for an unleveraged portfolio. 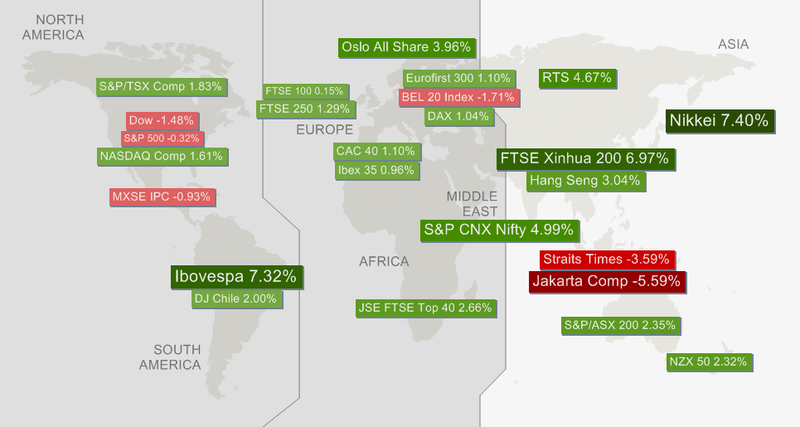 Posted in FX, Market Risk, Stock Market on September 11, 2013 by Pierre.